← Paramount Ranch – Where The Old Wild West meets Malibu? ** In honor of National Park Week. Free entry April 16-24! 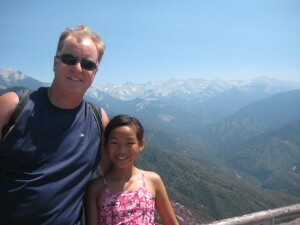 One of my favorite national parks in California has always been Sequoia National Park. It’s not quite as big and popular as Yosemite. That means it’s not quite as crowded! It’s beauty isn’t as grandeur as Yosemite either. 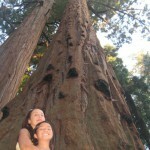 Yet, Sequoia is extraordinary, unique and very special, just the same. 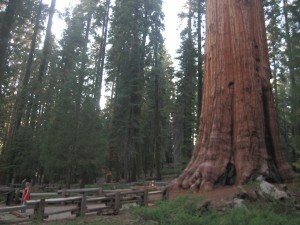 This park is most known for it’s giant Sequoia trees and let me tell you, they’re very impressive! However, there’s so much more than big trees here. 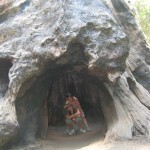 Let me share with you Sequoia National Park – Big Tree, Big Rock, Big Hike!! 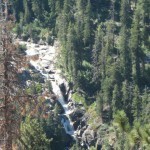 Located in the Southern Sierra Nevada Mountain Range, just east of Visalia, California. This park spans about 631 sq miles, with the highest point in the contiguous 48 United States, being Mount Whitney, at 114, 505 ft. above sea level. 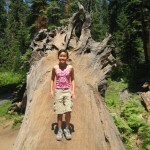 Sequoia is just south of Kings Canyon National Park. 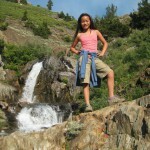 Both parks are administered by the National Park Service. 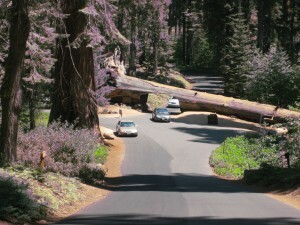 Most visitors come specifically for the extensive groves of Sequoia trees and you can see them right from the roadside pullouts. 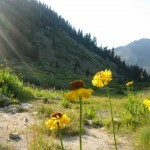 However, the park’s beautifully groomed hiking trails is where you’ll really experience these majestic tre. Although, you can stay in your car and drive right through one of them!! 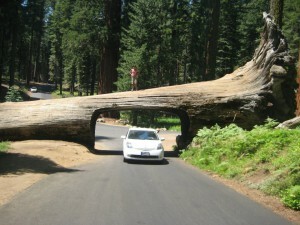 Yep, one of the biggest attractions is the Fallen Tunnel Log of Sequoia National Park, located on Crescent Meadow Road. The tree fell across the road in 1937 from natural causes. When it went down, it was 275 ft. high and 21 ft. in diameter. This tree was determined to be over 2,000 years old! The summer after the tree fell, a tunnel was cut and a visitor’s attraction was made. I was lucky enough to drive through The Fallen Tunnel log when I was a kid with my parents. I was thrilled when my daughter was able to experience The Fallen Tunnel Log with us and she even got out of the car and walked over it. That crazy kid. 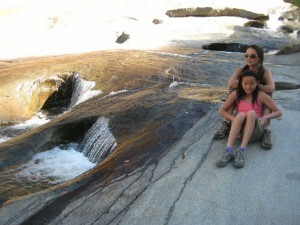 Sequoia National Park isn’t just about big Sequoia trees. 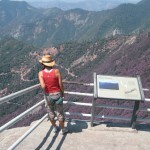 There are a lot of of other wonderful nature attractions to see and experience. The park is known for it’s extensive backcountry, which contains lakes, waterfalls, canyons and it’s high mountains and yes, that includes Mount Whitney. 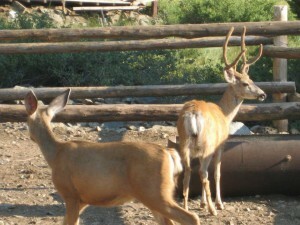 while you’re on your excursions in this magnificent park, there’s a very good chance you’ll see wildlife. 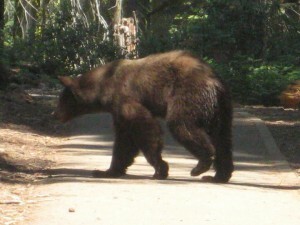 We saw a huge bear while hiking, as well as deer. They were very close to us on the trails The bear literally walked right across us on our trail. The bear didn’t bother us, but always be alert! 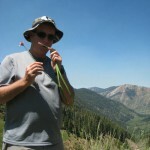 I’d love to share with you one of my favorite hikes of all times, a hike to The Franklin Lakes. This hike made us feel like we were in Switzerland. 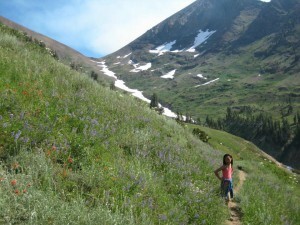 We were hiking in the heat of summer and yet we were walking through flowing creeks, beautiful green rolling hills with blossoming flowers and even snow! 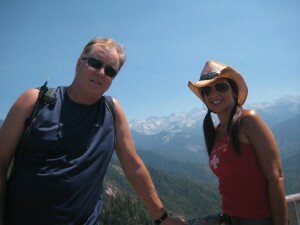 If you can make this hike a part of your trip to Sequoia, I promise you won’t regret it. It’s an amazing hike, but you’ll need at least 8 hours to get to the lake and make it back. 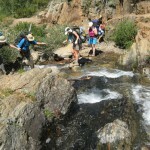 Many people do this hike as a backpacking overnight trip. 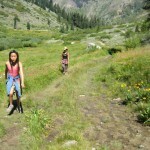 But, we managed to do a day hike and still experience the beauty of the backcountry. It was phenomenal! 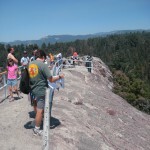 This hike is very popular, but it never feels crowded. 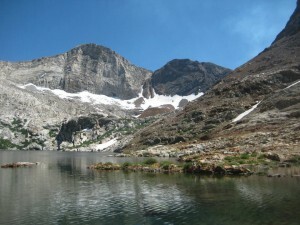 It’s a 12 mile roundtrip hike through a scenic basin, beneath the Great Western Divide, climbing up to Franklin Lakes (lower lake). 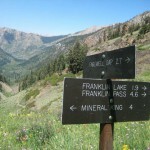 The elevation is 7,790 at the trailhead and 10,448 ft at Franklin Lakes. So, you’ll need to be in fit shape. This hike is considered to be moderate to strenuous. Also, this trail can take you to Mt. Whitney, if you continue on. 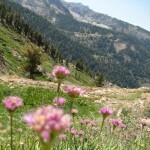 You’ll need to drive to Mineral King on a narrow road to get to the trailhead of this amazing hike. Enjoy!! Another hike I’d like to share is probably the most popular trail in the park. That means it’s pretty crowded. It’s a really cool hike, so I think it’s worth mentioning. 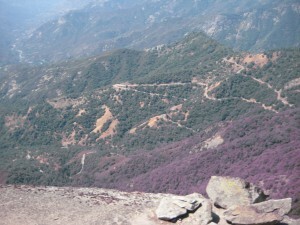 There trail is on Moro Rock in Sequoia National Park. This huge rock is visible from practically anywhere in the park, but especially visible from the main road, Generals Highway. 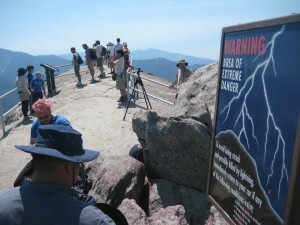 Moro Rock rises 6,725 ft. above sea level. 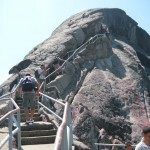 Luckily, hikers only walk on the top, at the 300 ft. mark of the rock. 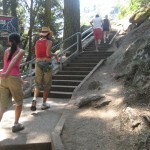 This hike consists of 350 steps and goes a quarter mile up the rock. 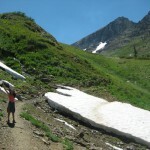 It’s one of the most picturesque trails you’ll ever experience! This trail is only a total of a half mile, but there are spots on the hike where you’ll cross ledges. So, if you’re afraid of heights, you may want to skip this. 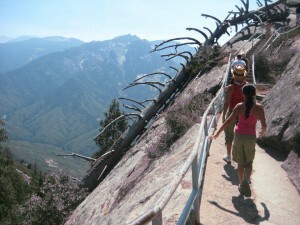 If you can handle doing this hike, you’ll make it to the top of Moro Rock and you’ll see the most magnificent 360 degree view of Sequoia National Park. 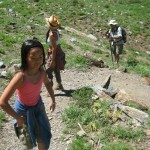 The trailhead starts from Crescent Meadow Road. Located south of the Giant Forest Museum, off the Generals Highway. Head east on Crescent Meadow Road for 1.5 miles. Then turn right, continue to the parking just beneath Moro Rock. 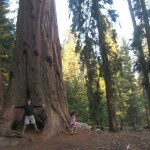 These are just 3 highlights of Sequoia National Park. 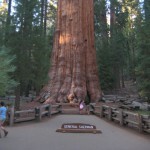 There are many other great attractions in Sequoia National Park, as well as Kings Canyon! I’ll post about where we stayed and ate in the area. 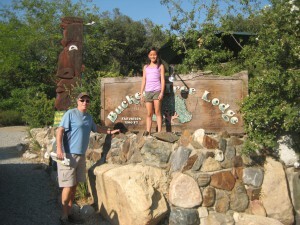 There’s a handful of lodging and restaurants, most are quaint and charming. Of course, there’s a big lodge in the park, as well. 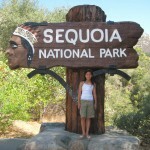 Sequoia is only about a 4 hour drive from Los Angeles and San Francisco, so no one has an excuse! Visit this gorgeous park and you’ll find yourself “Going California”! See you soon! 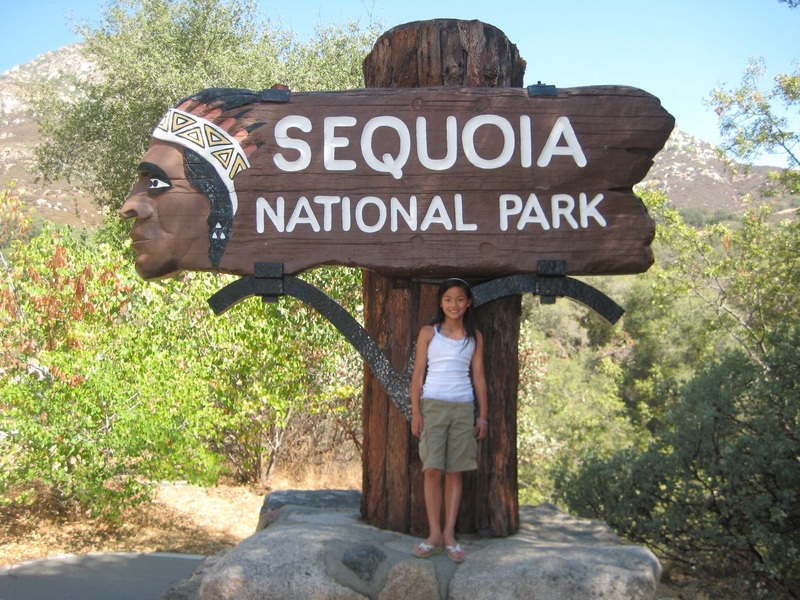 Yay, glad you love Sequoia too! I have so many pics of this beautiful park. I’m going to do a gallery & share with everyone!